So you suffer from ugly garage floors. Don’t worry, you are not alone, and it is an easy fix to boot. When your Arizona concrete garage floors have seen better times, or been forgotten, because you buried them under a pile of sports equipment, your kids’ toys and your golf equipment, it is easy to forgot about them. While your friends or family may tell you to just smack on some paint to make them look great, this is not really a solution that will stand the test of time. 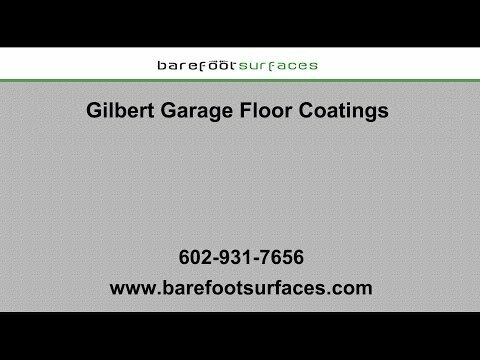 Barefoot Surfaces is your local Gilbert AZ concrete floor coatings expert, providing you with solutions that last. If you are unsure as to which garage floor coating is best for your particular situation, read on as we take a closer look at what options are available to you and your Arizona garage floors. While they are certainly one of the most affordable floor coating options for your garage floors, they are not as durable as others. Why is that? Because DIY kits are almost never as thick as the professional epoxy flooring Gilbert 85234. And the thicker the coating is, the better your Arizona garage floors will be protected from wear and tear, chemicals, oils gasoline and other harmful elements. A DIY kit usually has a thickness (after application and drying) of about 1.5 mils/coat. In contrast professional grade ones have a thickness of anywhere between 3.0 to 30 mils/coat. Think of it this way, when you are trying to scrape off paint from an old door or whatever, the thicker the coat, the harder it is to get off, the same holds true for your epoxy kit. And in this case, thicker is truly better. Why is your professional grade epoxy thicker? Because it has a higher solid to solvent ratio than the stuff you can get at the local hardware shop. And a higher solid content leads to thicker coats. While everybody is raving about the benefits and durability of an epoxy flooring Gilbert 85295, it may not be the best option for you Arizona concrete garage floors. Why? Because epoxy flooring Gilbert 85296 is non-permeable. If you recall from BIO 101 this means water cannot get through, which if the water is coming from above, is a desirable quality, but if the water is coming from below, because the ground is moist etc, then the epoxy will stop the moisture from coming through and you end up with a peeling epoxy floor. Solution: test for moisture BEFORE you apply the epoxy coating to make sure that moisture pushing through is not an issue. How Much Prep Is Necessary? Sadly you cannot just sweep up your saw dust or whatever else is on your Arizona garage and put down your epoxy coat. Ideally you grind up the surface enough (think sandpaper style) to make it rough enough for the epoxy to hold onto, but many DIY won’t put the energy in it and resort to acid etching. If epoxy flooring Gilbert 85297 isn’t feasonable for your individual garage situation, there are other alternatives you can try out to beautify and strengthen your garage floor. Gilbert Concrete Staining: Concrete stains don’t “sit” on top of the substrate but sink into it and bond with it this way. Why do we love them? For one, you don’t have the impermeability issue and for two, they are UV resistant and won’t fade like an epoxy coat might. Just like an epoxy or polyaspartic coating would, Arizona concrete stains also offer excellent wear resistance and they are environmentally friendly to boot. And you don’t have to worry about clean up, because they make that much easier as well. In short, if you have moisture issues, concrete stains and seal systems are an excellent alternative to the popular epoxy systems. Grind and Seal: This is another fantastic choice to treat your garage floors to some style while also making them more resilient. By first grinding impurities away and then sealing them, your Arizona garage floor will get a fantastic sheen, a polished yet modern look and is easy to clean as well. You can even add a stain after to give it some color, should you find the grey concrete to be too boring. No matter what system you end up using, it is always a great idea to consult your local Gilbert garage floor coating expert. Barefoot Surfaces has years of experience in providing Arizona with beautiful and lasting garage floors. Our coatings are sure to stand the test of time and are suitable for outdoor and indoor use. Contact us today to learn more about our quality Gilbert epoxy floor coatings, concrete stains or garage remodels.